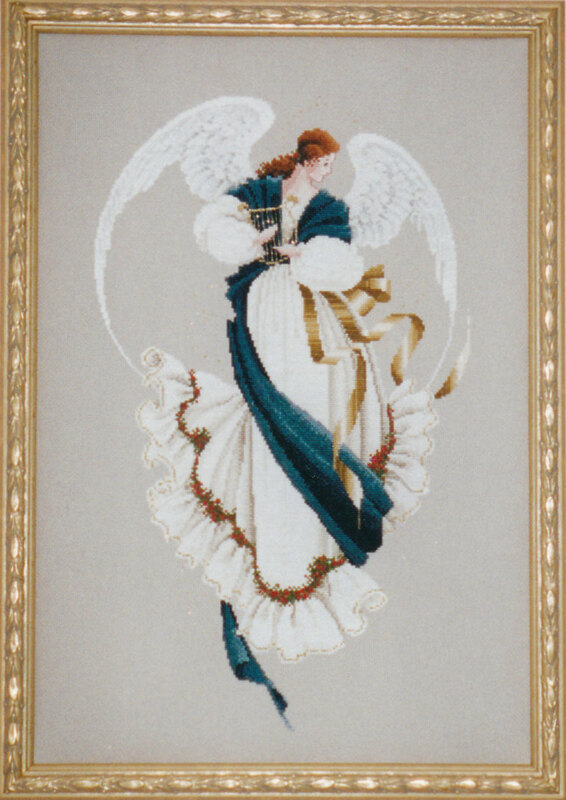 I finished this angel for my sister, Anita, several years ago (before joining ANG). I meant to post this on her birthday (March 29) but since she was born on Easter, this is still timely! She had started it & then didn’t have the time (or inclination?) 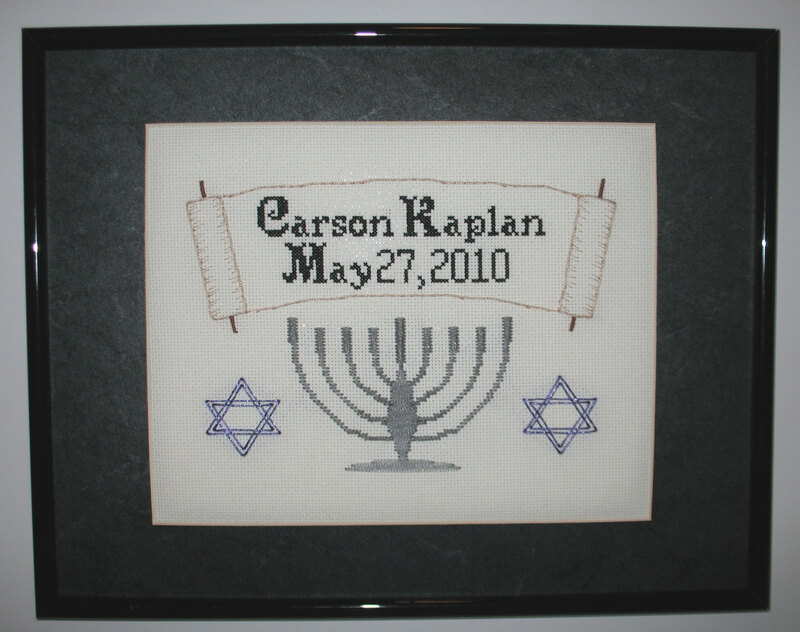 to complete this counted cross stitch piece. How could I say no when she asked if I would do it for her? It was quite challenging to follow the chart as I recall. There were a lot of shades of blue, white/gray, & gold. And, there are a few deviations – not that anyone would be able to tell. Just in time for Calder’s 3rd birthday, I have finished his baby piece. And, I am early for Carson’s first birthday! I’m very happy with how they turned out & hopefully mom & dad will too. Although kids do like seeing their names on stuff, I don’t expect the boys to get too excited. Happy Birthday boys!! 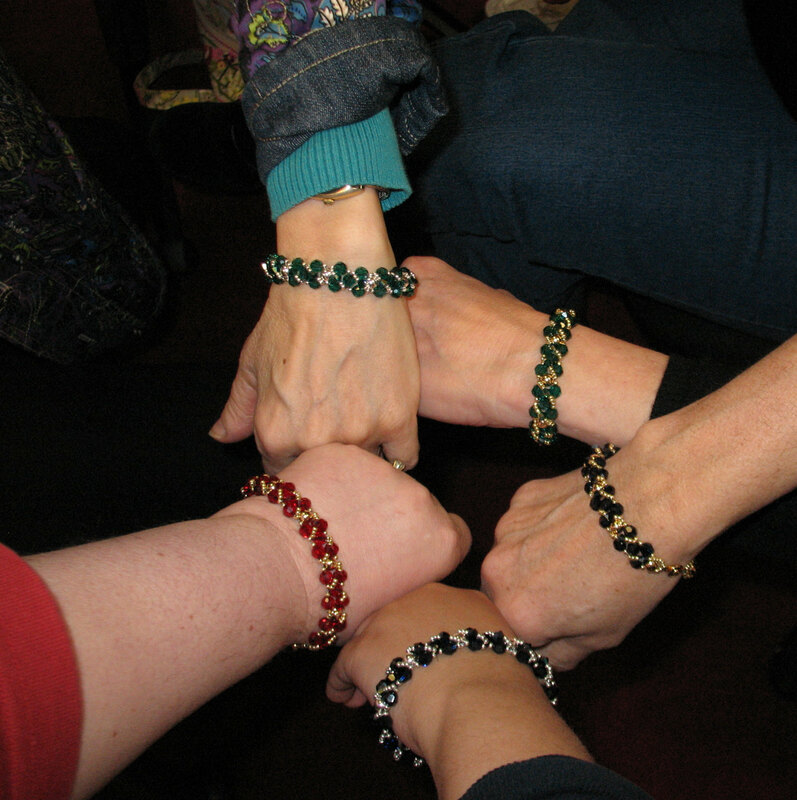 Lori, our current President from Main Line Stitchers, taught a jewelry beading class to a few of us today. Great class. Lots of fun. 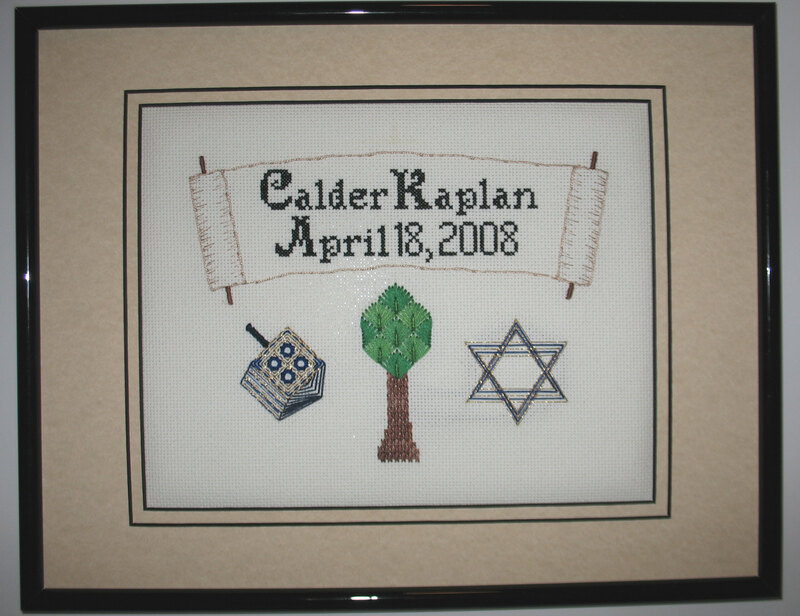 It was wonderful to start & finish a project in ONE sitting – that never happens with needlepoint! We pre-selected either dark indigo, siam red (deep burgundy), or emerald green Swarovski crystals with either silver or gold accents. This was the base we built first. 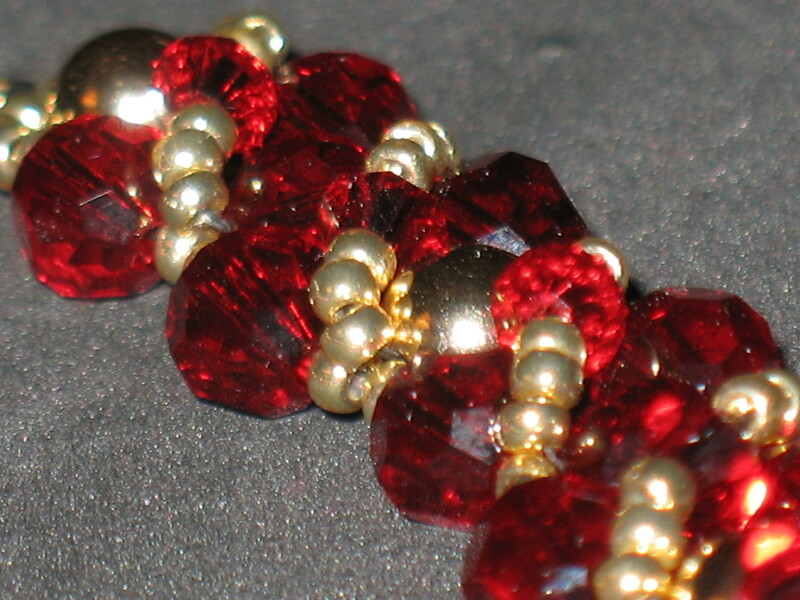 Then, we added a criss-cross embellishment that added the glitz & glamor! 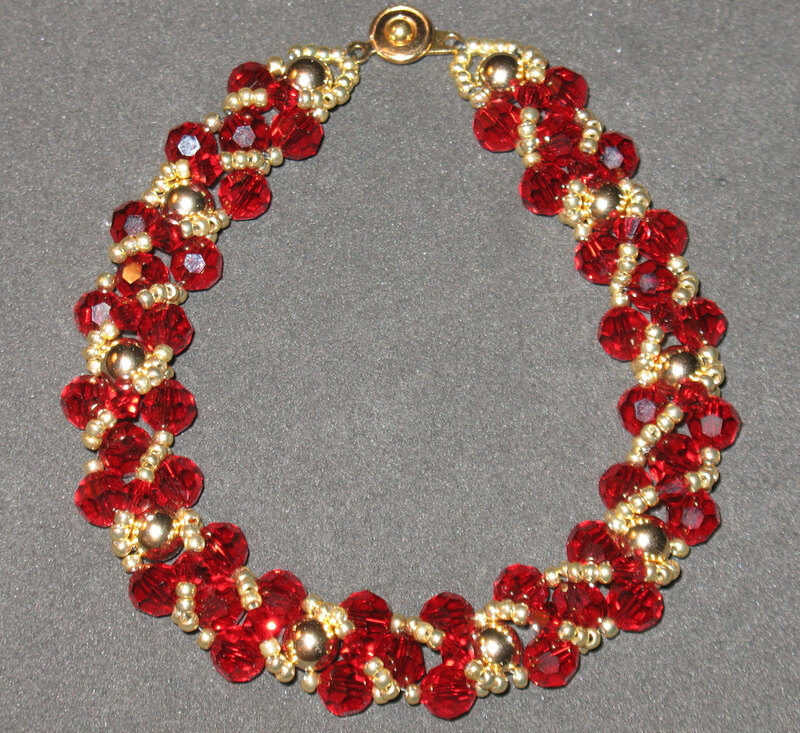 Added a clasp & it was done. Looked good in green with either silver or gold. A few of the girls showing off our glitz! Ho, Ho, Ho, Santa’s done & ready to go on a trip – not to the North Pole – just to the finisher! That was a fun project & not difficult. More than enough materials were provided. And, the directions were clear. Thanks to Kelly for telling me to stitch a few rows around the piece before taking to the finisher. I see now Kelly said 2 rows but I did 4-5 – sure hope that isn’t too many. I love the fur on the hat!